As we cross 2015’s mid, its time to speculate about devices expected in second half of 2015. We’ve got several devices that can be expected so far, which include the Xiaomi Mi5, Apple’s much hyped about iPhone 6S Duo, two alleged variants of the OnePlus 2 and Google’s Nexus 6. While last year’s Nexus 6 was a well designed device by Motorola and came with its fair share of top tier specifications, the device was a tad bit too expensive for Nexus lovers all around. We’ve seen several bits of information about this year’s Nexus and today Chinese analyst Pan Jiutang has made some more claims about the upcoming device. Qualcomm’s Snapdragon 810 will perhaps be one of the US chipmaking giant’s worst memory in recent times. For a processor that was heralded as revolutionary, the processor saw an unfortunate load shifting on its lower powered Cortex A53 cores in cases of high performance usage. But even though Samsung’s choice of the Exynos 7420 on the Galaxy S6 Duo led some to believe that the SoC would be a complete flop, we’ve seen several manufacturers adopt it on their devices, giving mixed results in the process. 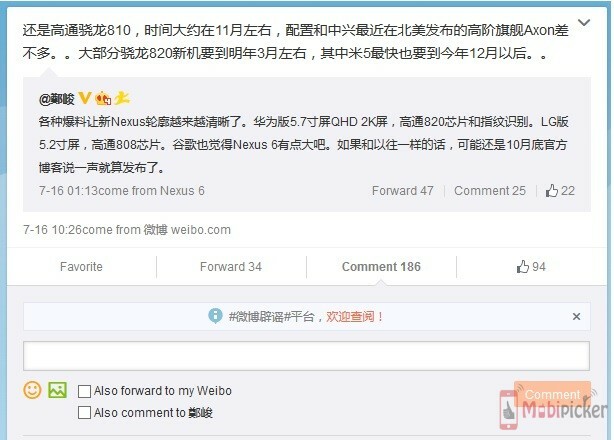 According to Pin Jiutang, the upcoming 2015 Nexus, said to be manufactured by Huawei, will also be choosing the Snapdragon 810 as its processor of choice. Even though we’ve heard several claims so far that pin this year’s Nexus with the Snapdragon 820, Jiutang believes that Qualcomm’s custom cored chipset won’t be available until December of this year, which should be too late for Google and Huawei to launch the Nexus. You can however expect the device with QHD display, so the Nexus won’t disappoint in the resolution department by any means. So, this in all likelihood pins the Nexus with the Snapdragon 810. But before completely rejecting Qualcomm’s current flagship processor, it would be wise to consider that it has had quite a lot of time to improve it. V2.1 of the Snapdragon, while not perfect, saw improved load management and maybe the Huawei made Nexus will feature another upgrade. After all, consecutive processor failures for Qualcomm won’t help it in the long run, no matter what the case. Sounds interesting really. Let us know what you think in the comments section below. The 2015 Nexus Will Be Built By LG On New Prototype; No Huawei In The Mix?